Have you always wanted to cook Vietnamese food? Learn to prepare several dishes from scratch in our Vietnamese Cooking Class. Guided by an experienced cook and local expert, you will receive tips on how to select fresh ingredients, followed by a hands-on workshop where you can cook your favorite Vietnamese delicacies. The choices of recipe are flexible, depending on guests' request. All ingredients are Halal and easily purchased in Malaysia (or homegrown). Vietnamese cuisine is light and less oily; always striking a balance between meat and veggies as their main menu. We take pride in our meal preparations- always marinating our food with spices sparingly, basking high-quality, fresh ingredients for its sweetness and gustation, making it one of the healthiest food in the world. 1. Banana blossom salad with chicken - learn to choose the good banana blossom, to cut it thinly and make dressing for it. Having meal with food we have cooked with rice. Having meal with food we have cooked. Having meal with food we have cooked. Printed recipe is provided. Students to bring a long container if want to pack food home. 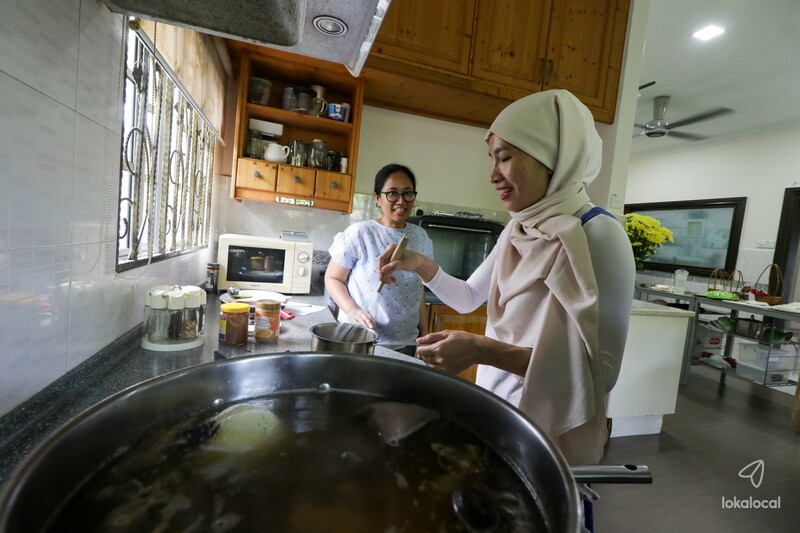 Learn to cook your own Halal Vietnamese food. Find out how you can pick the best ingredients for your dish. Then cook up a storm with help from your local expert! Enjoy the food that you've made yourself. Loved this class! Mai has elevated the boring fish into a superstar using simple everyday ingredients. From the gorgeous steam fish wraps and its dipping sauce full of umami, to the flavourful red snapper soup swimming in its rich tomato turmeric broth and the tomato fish with the burst of dill, it was heaven. Thank you Mai for sharing your family favourites and showing me the true beautiful flavours of Vietnam. Can't wait to try at home!! Thank you so much Mai for welcoming me into your home and showing me how to cook amazing pho and make amazing spring rolls! I loved your magical garden of herbs and how they added an extra special taste to the rolls. Hope to come back for more classes! Mai has been a lovely lady and her teaching skills were excellent. I would like to thank her husband for making us vietnamese coffee. It was very sweet of both of them. However, I feel that Lokalocal team has to pay a visit to her home. It is simply an embarrasment taking expats to her home to learn Vietnamese Cooking. The place stinks and we had flies in the house. The ventilation was very poor and some times I had to leave the kithen as I was feeling nausious. Things were untidy at her home and dirty and imagine eating what we had prepared for the day under the dirty environment. Dont simply sign up all chefs for the sake of making money! Thank you for your review. We’re sorry to hear that this class has not met your expectations. LokaLocal takes great effort to ensure our hosts offer quality experiences. Our team has attended Mai’s class, and considered the positive feedback her guests have given over the years, before confirming that it is safe and suitable for our customers. Some of our experiences take place in the local’s home, which allows for a more local perspective.